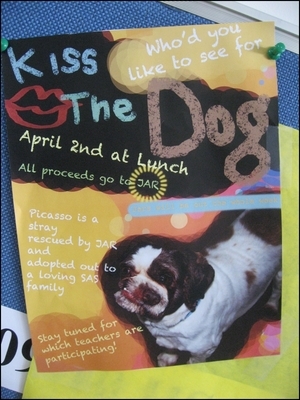 'Kiss the Dog'?...what is that you ask? 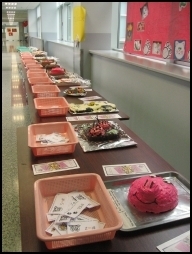 It was a successful and fun event and the teachers and students raised a whopping 10,000 RMB! Thanks again to the support that Marney and her group has done for JAR. 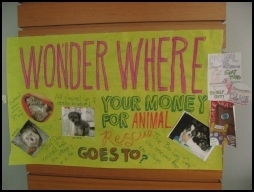 The group has made things possible to support more vulnerable animals and assist further with projects ahead! 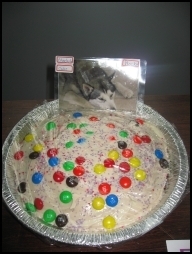 Thanking YOUMAO for their support in donating 10 bags of dog food to JAR and our rescue group! 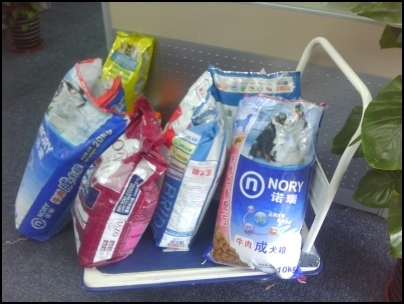 We will distribute the dog food to Baoshan and other rescuers in our rescue group! 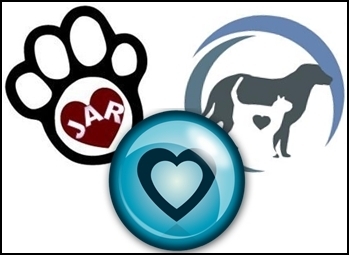 JAR is now going to be using WORDPRESS for any updates, newsfeeds, and blog contents! 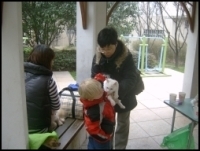 As the spring weather is here, more and more strays are seen and walking about in the city of Shanghai. Not only that, it's that time of the year where you would expect to find and hear little cries from kittens or puppies, whether they are hiding in the bushes, abandoned, or just in plain view to see. This was the case for us the night of 23rd March. We received a phone call from a fellow rescuer in Puxi and informed us that a local Chinese woman's dog gave birth to 8 puppies and had a 3 month old puppy in her place. The obvious thing we did was arrange to meet up. There were 4 of us in total. 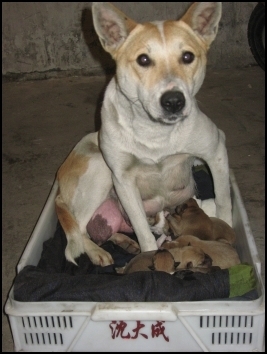 The woman told us that the mother dog gave birth to 10 puppies last year (sold them to people) and now 8 again this year. We had a slight battle on our hands in trying to convince the woman and her husband to surrender the mother, puppies and the 3 month old. Eventually after long negotiations (so glad that our Chinese friends and rescuers were there to save the day! ), they decided to give us the puppies. 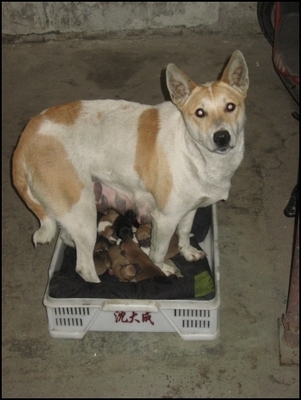 As you can see from the 1st set of pictures, the mother had her pups in a small tray, barely enough room to move around and was a risk for the pups getting crushed! We luckily found a pet store close by and bought a large enough crate for her to manouevre in. The puppies are only a couple of days old. We are going to wait till the puppies have weaned, spay the mother and have the puppies vaccinated and hopefully adopted or fostered out to willing families! 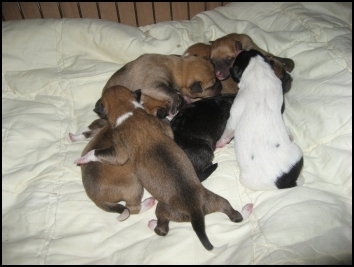 We anticipate to have the puppies available for adoption/fostering week commencing 19th April, 2010. If you are interested in either fostering, adopting or know of somebody who would like to have a pet, please get in touch with us!! 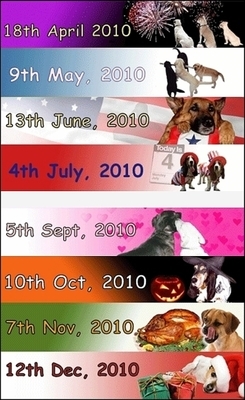 Please see our Adoption Day dates below! Location:Papas Bierstube, Shanghai, Hongmei Road 3338, Hongmei Pedestrian Street 22-24, Tel/Fax: 021 - 6465 8880. New location for JAR Adoption Day! Finally, JAR has a place to hold Adoption Days! Thanking the owner of Papas Bierstube for agreeing and cooperating with JAR to hold Adoption Days and future events. Hopefully, this is a start of a good working relationship. 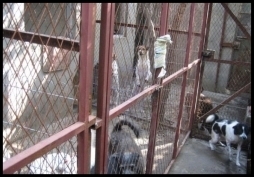 JAR - Jaiya's Animal Rescue will be holding their Adoption Day at a new location in Hongmei Lu. 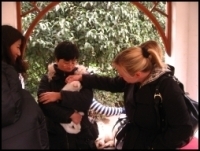 Come, join us, and see our wonderful animals available for adoption. Another successful weekend! Total 3 dogs & 2 kittens got adopted! On Saturday, February 20th, I went to Baoshan with a friend who in turn introduced me to Ayi Wang. 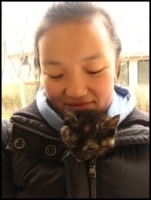 Ayi Wang is a caring and kind hearted individual who herself has personally rescued abandoned and abused dogs (22 dogs / 6 cats in the shelter and 5 dogs / 4 cats in her home!). For the past couple of years she has housed them in a building with limited space and resources (linen, food, medical care etc). Everyday, she takes a bus which take over an hour to the vicinity to feed and check up on the dogs. She has 5 other ayi friends helping her, however, with no funding, they can only do so much in providing the animals medical care & pet supplies. Currently each pen (4 in total - 3 pens for the dogs and 1 pen for the cats, approx 7 x 4 feet in size) holds 7 dogs per pen. I have seen the dogs and they are all adorable and wanting attention. I am just glad that these dogs are out of harms way, however, their living conditions need to be drastically improved. Apparently, all of the dogs have been vaccinated, dewormed, deflead and desexed. This is something that we would like to have a veternarian come out and thoroughly check. Ayi Wang is doing her best in caring for these animals and seeing the situation on Saturday has inspired me to help this person and the animals. 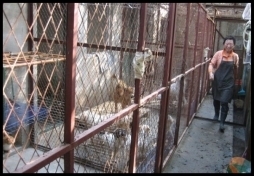 The goal now is to raise 10,000 RMB (this is the cost to build them a proper kennel). This will provide a bigger home & space for the dogs/cats. It will also give us the opportunity to health check each dog/cat, have them professionally groomed and provide them with pet supplies, linen, food, bones etc with extra funding received. Once the donations have been received, the contractors will take approx 2 months to build the units. 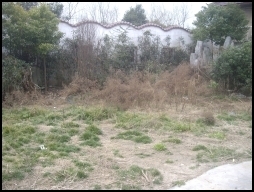 The home will provide ample space and walking area for the dogs to be exercised in and an area for play. We will have the dogs/cats screened (health) and ensure their temperament and character is deemed ready for adoption. Slowly but surely we will push to have the animals adopted out to good homes and to loving families. To provide education and outreach in the community, medical services for needy animals, upgrade facilities for homeless animals, and strong adoption programs to ensure that every companion animal lives in a safe, loving and secure home. Thank you for considering this request for your support. If you have any questions about this project, please do not hesitate to contact us via email or on 136 3662 4300. 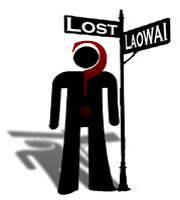 Article published on Lost Laowai! 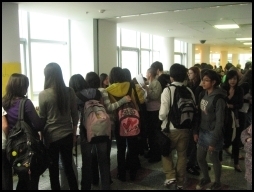 The No-nonsense China expat and traveller community! 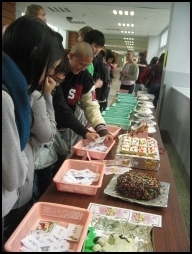 Shanghai American School - Cake Walk Fundraiser for JAR!! 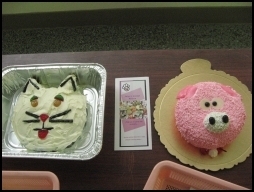 Julia and I would like to thank all the students who have participated and did wonders at the 'Cake Walk', SAS for letting the group use an area of the school, and for those who baked wonderful cakes! Special heartfelt thanks to Marney for arranging and organising the event. She made it happen and we appreciate all the things that she and her group have done. 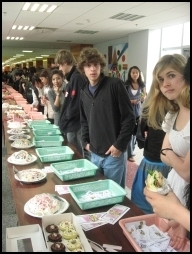 Near 5,500 RMB was raised. 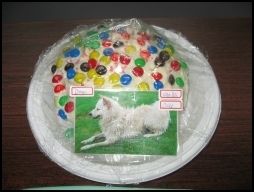 The donation will help JAR pay for the spaying of the mother dog that we saved a week ago in the village. Check out the story on Bai Long Gang gang. We also plan to neuter a cat that is slowly getting used to us in our compound. Recently, a dog was rescued in Jiading district by an intern. JAR will help him with the medical fees and work on getting the dog adopted. Thank you again for all your support and choosing JAR as one of your designated charity to raise money for. 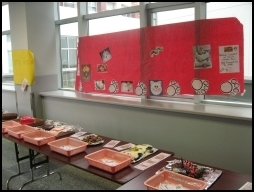 Please find some pictures of the event below! Enjoy!